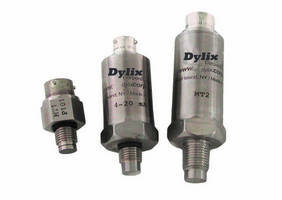 Dylix’s MT Series Pressure Transducer is designed for the OEM and end user where ruggedness, high performance, and reliability are required at a competitive price. Key feature of the MT is its non oil-filled sensing element. The sensing diaphragm is machined from a solid piece of steel, and can withstand the most abrasive / cyclical applications. Dylix’s engineers developed this product to last in high cyclical environments with or without the presence of waterhammering or spiking. Advanced manufacturing techniques, extreme environmental burn-in and thorough residual stress relieving procedures ensure the MT Series maintains its performance over time. Every MT Series is shipped with a NIST traceable calibration certificate.